The Three Body Problem is a four hundred year old problem of mathematics which has its roots in the unsuccessful attempts to simulate a heliocentric Sun-Earth-Moon system. Due to the nature of Newtonian Gravity, a three body system inherently prefers to be a two body orbit and will attempt to kick out the smallest body from the system—often causing the system to be destroyed altogether. There are a limited range of scenarios in which three body orbits may exist. It is seen that those configurations require at least two of the three bodies to be of the same mass, can only exist with specific magnitudes in specific and sensitive configurations, and exhibit odd loopy orbits that look quite different than the systems of astronomy proposed by Copernicus. The slightest imperfection, such as with bodies of different masses, or the effect of a gravitational influence external to the system, causes a chain reaction of random chaos which compels the entire system to fall apart. “ There's a physics problem so difficult, so intractable, that even Isaac Newton, undoubtedly the greatest physicist who ever lived, couldn't solve it. And it's defied everyone else's attempts ever since then. “ At the beginning of the 18th century, Newton famously wrote that the solar system needed occasional divine intervention (presumably a nudge here and there from the hand of God) in order to remain stable.11 This was interpreted to mean that Newton believed his mathematical model of the solar system—the n body problem—did not have stable solutions. Thus was the gauntlet laid down, and a proof of the stability of the n body problem became one of the great mathematical challenges of the age. In 1885, Poincaré entered a contest formulated by the King Oscar II of Sweden in honor of his 60th birthday. One of the questions was to show the solar system, as modeled by Newton’s equations, is dynamically stable. The question was nothing more than a generalization of the famous three body problem, which was considered one of the most difficult problems in mathematical physics. In essence, the three body problem consists of nine simultaneous differential equations. The difficulty was in showing that a solution in terms of invariants converges (This isn’t likely to happen today - that the birthday of any contemporary world leader is celebrated by a mathematical competition!). Henri Poincare was a favorite to win the prize, and he submitted an essay that demonstrated the stability of planetary motions in the three-body problem (actually the restricted problem, in which one test body moves in the gravitational field generated by two others). In other words, without knowing the exact solutions, we could at least be confident that the orbits wouldn't go crazy; more technically, solutions starting with very similar initial conditions would give very similar orbits. Poincaré's work was hailed as brilliant and he was awarded the prize. “ Q: What is the three body problem? The three body problem is to exactly solve for the motions of three (or more) bodies interacting through an inverse square force (which includes gravitational and electrical attraction). “ The new solutions were found when researchers at Shanghai Jiaotong University in China tested 16 million different orbits using a supercomputer. Perhaps the most important application of the three-body problem is in astronomy, for helping researchers figure out how three stars, a star with a planet that has a moon, or any other set of three celestial objects can maintain a stable orbit. But these new orbits rely on conditions that are somewhere between unlikely and impossible for a real system to satisfy. In all of them, for example, two of the three bodies have exactly the same mass and they all remain in the same plane. In addition, the researchers did not test the orbits’ stability. It’s possible that the tiniest disturbance in space or rounding error in the equations could rip the objects away from one another. “These orbits have nothing to do with astronomy, but you’re solving these equations and you’re getting something beautiful,” says Vanderbei. Aside from giving us a thousand pretty pictures of knot-like orbital paths, the new three-body solutions also mark a starting point for finding even more possible orbits, and eventually figuring out the whole range of winding paths that three objects can follow around one another. As suggested, the field of Celestial Mechanics is still on step zero—the stone age. The found orbits are nothing like heliocentric astronomy and there will be an attempt to use them as a skeleton to "build the whole system up from." 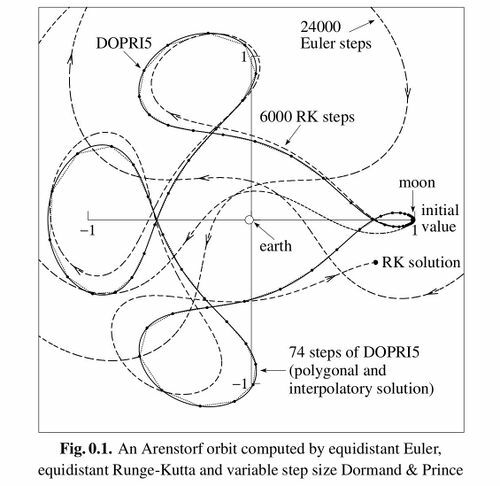 Arenstorf orbits are the knotted closed trajectories which are the result of Restricted Three Body Problem solutions. The available solutions to the Three Body Problem, beyond being unlike anything seen in Heliocentric Theory, are so sensitive that the slightest change or imperfection will tear the entire system apart. 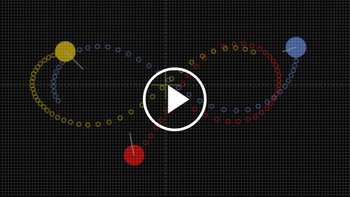 As a very illustrative demonstration, take a look at this online Three Body Problem simulator that uses the simplest possible figure eight pattern, which requires three identical bodies of equal mass that move at very specific momentum and distance in relation to each other. This is precisely the issue of modeling the Heliocentric System, and why its fundamental system cannot exist. Only very specific and very sensitive configurations may exist. The slightest deviation, such as with a system with unequal masses, or the minute influence from a gravitating body external to the system, will cause the entire system to fly apart. The reader is invited to decide for his or her own self whether those scenarios would occur in nature as described by popular theory. “ Our solar system is an N-body system. N-body simulation is the simulation of astral bodies under gravity, using laws of classical mechanics to define how the astral bodies move. The goal of our project is to model the N-body problem in NetLogo. Code defining how astral bodies interact implements the inverse square law and a gravitational constant to calculate gravitational force between them. The PDF report explains with additional details that all attempts at observing orbit were unsuccessful. Universe Sandbox 2 (Universe Sandbox ²) is a physics based space simulation developed and published by Giant Army. It has often been claimed that this simulation provides evidence that the Sun-Earth-Moon System and the Solar System are able to be simulated with Newtonian Gravity. “ By default, the simulations in Universe Sandbox ² try to set an accuracy which prevents orbits from falling apart due to error. This means setting a maximum error tolerance for each step and also making sure the total error doesn’t reach an upper limit. This page was last modified on 21 April 2019, at 02:21.